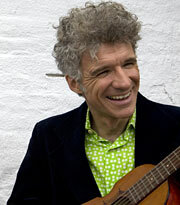 GRAMMY® Award winner Dan Zanes will celebrate the release of his new family album, Little Nut Tree, at The GRAMMY Museum on Saturday, November 5, 2011 with special guests from LA's own Harmony Project! The program, part of the Museum's Musical Explorations family series, will bring Zanes' multi-generational dance party to the 200 seat Clive Davis Theater from 11am - 12pm. Little Nut Tree, which will be released on September 27th, features a number of guest artists including Andrew Bird, Sharon Jones and Joan Osborne. "It's been almost five years since Catch that Train!, our last release of this type and in that time not only have we done a lot of singing but we've danced our tails off!" Zanes' said. Families can expect to do the same when they come to the GRAMMY Museum on November 5!